1987 Bertone (Fiat) X/19 - The X/19 had a lot going for it and a lot working against it. The good included its suspension and mid engined design. This car handled like few other sports cars handled, even ones costing much more. It was also great to look at, looking far more exotic than the seventies British sports cars it was competing against when it was introduced in 1972. The bad was its build quality and somewhat anemic engine. Being a Fiat by birth, it rusted in that way that only Fiats rusted. Electrical systems were problematic as were the cooling systems. The 1500 cc engine, although fuel injected since 1980, was no rocket and the car wasn't anywhere near as quick as it looked. The car on eBay is interesting for its factory "Corsa" ground effects kit. I've never seen this on an X/19 before. I'm not sure I like how it looks, it kind of makes it look a little like a Fiero, but its rarity makes it interesting. Being offered by a one time Bertone dealer, Click here to see the eBay listing for this car. 1974 Alfa Romeo Spider Veloce - About 2 weeks ago this turned up on a high-end used car lot I pass everyday on my way to work. I finally stopped and looked at it. I didn't hear it run or drive it, that would have made it way too tempting to buy, but the body does look as good as the seller states in his ad. The mechanical modifications done to this car are good ones and not overkill. I've owned two Alfa Spiders, the last one left my life about 2 years ago. On a warm summer night, with the top down and the radio off, driving an Alfa Spider on a long, twisting mountain road isn't close to nirvana, it is nirvana. Located in Hadley, MA, Click here to see the Craigslist ad for this Alfa Spider. 1985 BMW 524td - This is a great bio-diesel candidate. BMW jumped on the (perceived, but not real) US diesel bandwagon in 1984 with the 524td. Sold in the US for only 2 model years, 1984 & 1985, the 524td didn't sell well. The US never took to diesel powered cars the way the Europeans did. The 524td had all the considerable virtues of the gasoline powered E28 5 Series. It's just a lot slower. I vaguely remember hearing complaints about the turbo diesel engine when it was new, but in doing a little research I could find no mention of any glaring faults. In fact, I found several cars that had gone 300,000 + miles without any major engine work. I want to help the environment in any way I can and I want to see the US break its dependency on foreign oil, but I'm not yet ready to drive a bio-diesel car. (Sorry) If I get to that point though, a BMW 524td would be the car I'd go looking for. Located in Atlanta, GA, click here to see the AutoTrader.com ad for this 1985 BMW 524td. 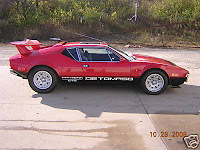 1972 DeTomaso Pantera GTS - Someday I'll do a complete post about a Pantera, but right now I just want to post this car. This is a claimed 12,000 mile car. According to the seller it was special ordered with the glass sunroofs by a US senator (he doesn't say who). This is a GTS, which is rare, although it's essentially a cosmetic package. Performance is the same as a standard Pantera, which means it's very, very good. The rear spoiler was not part of the GTS package and was added to the car sometime in the 1980s. If I bought the car I'd remove it. I have no idea why someone would buy a car like this and then drive it less than 400 miles per year, but that's apparently what happened with this car. I can't imagine there are many sub 12,000 mile Panteras left in the world. This should have been called the "rust post" All of those cars rusted badly. I still wouldn't mind owning any one of them - except for the diesel 5 series.